Here we go, another cake online shop blog design. 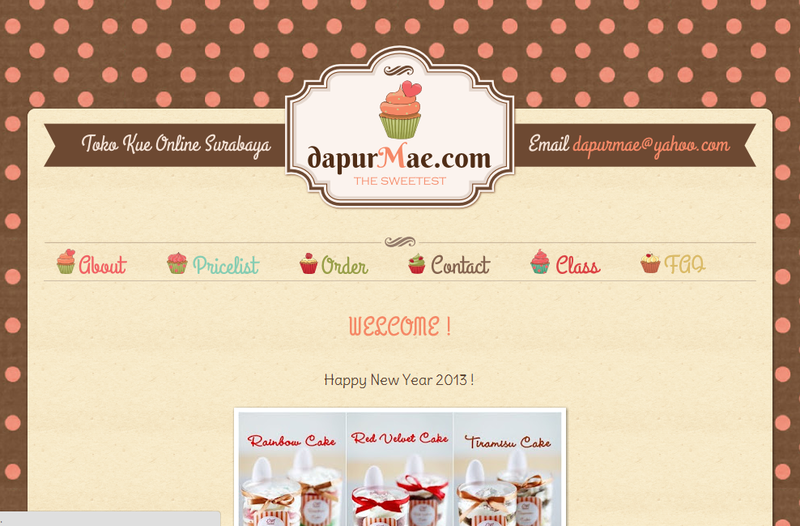 Dapur mae is a cake shop based on Surabaya, Indonesia. Mrs Mae ask for vintage yet fun design and she request dark brown and soft orange color. Mixed with paper texture as background and vintage logo, make her design come true. Here is the Dapurmae blog preview. so beautiful templates, anyway how can editable cake made? there are real photo on the cake, is there any printer to do that? just want to help answer, yes there is a printer for those kind of cakes, its knows as edible image. The ink are printed on the sugar base paper. Hy..Ipietoon...Template2 hasil karyanya sangat unik dan lucu2..Mau nanya nih, untuk membuat logo atau header2 yg lucu bgitu, buatnya pakai apa ya ? atau ada yg free di google ? hi.. pliz teach me how to apply for that..